Espresso-machines make great coffee, but there must be more advantages to owning such an expensive coffee maker. Are they worth their high price tag? Do they clean up after themselves? Is the coffee of such great quality? Do they make “real” espresso? 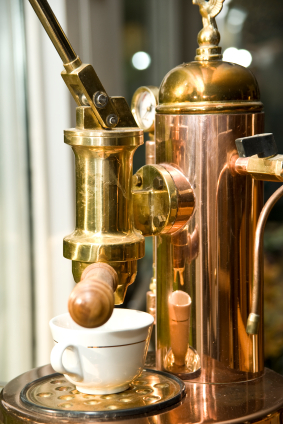 What else can you use an espresso-machine for besides coffee beverages? Do they really make cents? The super coffee makers are expensive but they are also worth every penny as I will be happy to explain. These coffee machines are absolutely fabulous! I know of one person who owns one and doesn’t even drink coffee. These fabulous coffee makers have many handy uses. And these machines do clean up after themselves. The super-automatic machines, grind, tamp, and pull the espresso shot for you, all of this while you push a button and do nothing else at all. After making your shot of espresso, the machine dumps the used coffee grounds. You do nothing else, no grinding, no mess, nothing. So yes, they do indeed clean up after themselves. Is the coffee produced really any good. Yes, it is awesome! Did you know Starbucks now uses super-automatics? The coffee or cappuccino or whatever beverage you choose to create with these automatic coffee makers is unique in that the brewing process is superior to the drip process of brewing coffee. You must try it! Is the espresso they produce real? Absolutely! Because it is made with the touch of a button as opposed to a manual process that is rather messy and more time consuming, does not mean the espresso is not real. Believe me, it is real, with the cream, the flavor, and the convenience! Other uses for these amazing super-automatics include instant hot water for tea, cooking, and cleaning. The steam wand is nice for reheating hot beverages. The hot water is handy for hot tea as well as preparing iced tea. If you love coffee you probably have recipes that include coffee. Tiramisu, Mudd Pie, are only two of my favorite which I will publish later. Have you ever needed some hot water to soak or clean small objects. Perhaps you need to loosen a lid on a jar, or to melt or soften wax. Maybe you need a little hot water to warm an object. I can go on forever. I love automatic espresso machines and I have found them to be handy tools in the kitchen. I enjoy the quality the coffee they make, I am amazed at the simple and clean convenience, and I use my machine as a source of hot water. I make my own coffee beverage at home and that alone makes my machine pay for itself. This entry was posted in Food and Drink on January 16, 2014 by admin_z.